Surviving Hitler: A Boy in the Nazi Death Camps. 100 ME:PersonalName $a Personal name Andrea Warren. 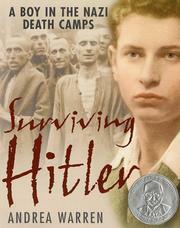 245 Title 0 $a Title Surviving Hitler: A Boy in the Nazi Death Camps. 260 PublicationInfo $b Name of publisher, dist, etc Harper Trophy. 300 Physical Desc $a Extent 146.